What Ridiculous Used Car Should I Buy And Write About? Well, Jalopnik, the day has come. The day I am referring to is the one where I take my hard-earned cash and spend it on a used vehicle that I will write about for your amusement. Now, I know what you’re thinking: who the hell are you? And the answer is: someone who is, quite obviously, crazy. This will become especially evident when you see my car choices. But also someone who has written a few articles that have been largely well received here, except by my mother, who calls and says: “That’s nice, Doug. Now when are you going to get a real job?" It’s not an easy task, choosing a used car. 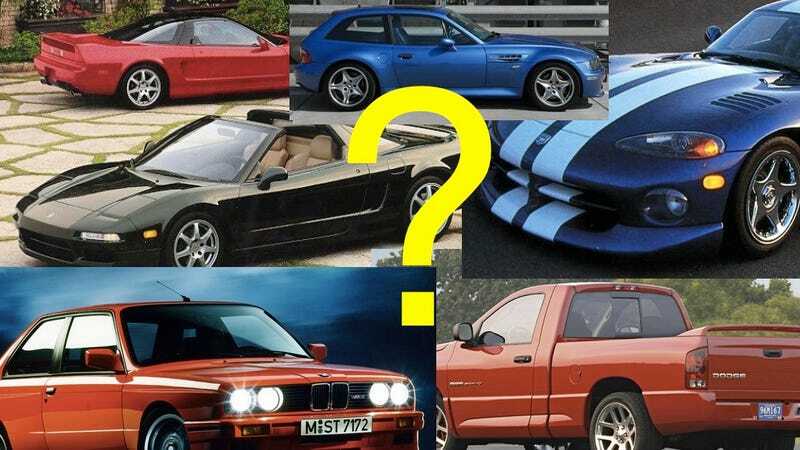 I know this because I recently posed the question on my website and garnered more than 50 different suggestions, some of which were the Lotus Esprit. Several people made this suggestion in complete sincerity, almost undoubtedly because they will not have to spend their own money to keep it running. 1. There are a lot of cool cars. 2. We want all of them. 3. A Lamborghini LM002 would be optimal. There’s also a budget: $30,000. This number is somewhat flexible, as I sometimes find myself calling people who are selling 993 Turbos. (These conversations usually end when I ask “At what speed does it kill bugs?”) But let’s try to stick close to $30,000 so I don’t need to follow my mother’s suggestion of seeking gainful employment. A few other rules: It's important that I can re-sell the car when I’m done, which eliminates pretty much anything manufactured by Maserati. I don’t have a garage, so a true collector car is out of the question. And I’d prefer if it were located near Atlanta, which unfortunately has roughly the same car culture as Pyongyang, except with more Escalades. Cons: Nearly every NSX on the used market has a rear wing that could function as patio furniture. Pros: It's a 25-year-old BMW with a four-cylinder engine, and yet it costs as much as a new Volvo. Someone should really figure out why. Cons: Every single E30 M3 is located in Southern California and costs twice as much as it should. Pros: A high-performance BMW shooting brake. Do I need to elaborate? Cons: Early cars were down on power, later cars were up on engine problems. Also: you can only make so many clown shoe jokes. Pros: Nine miles per gallon, enormous, ridiculous, extravagant. Cons: Nine miles per gallon, enormous, ridiculous, extravagant. Pros: I could take this thing anywhere, with the obvious exception of most city streets. Cons: Absolutely impossible to re-sell, since there is not a person on earth who wants one of these. Also, my girlfriend has understandably announced she will not speak to me if I purchase this. So: do you like my ideas? Do you have any of your own? Feel free to speak your mind, as I’m interested in more opinions – unless, of course, you’re going to tell me to get a real job.